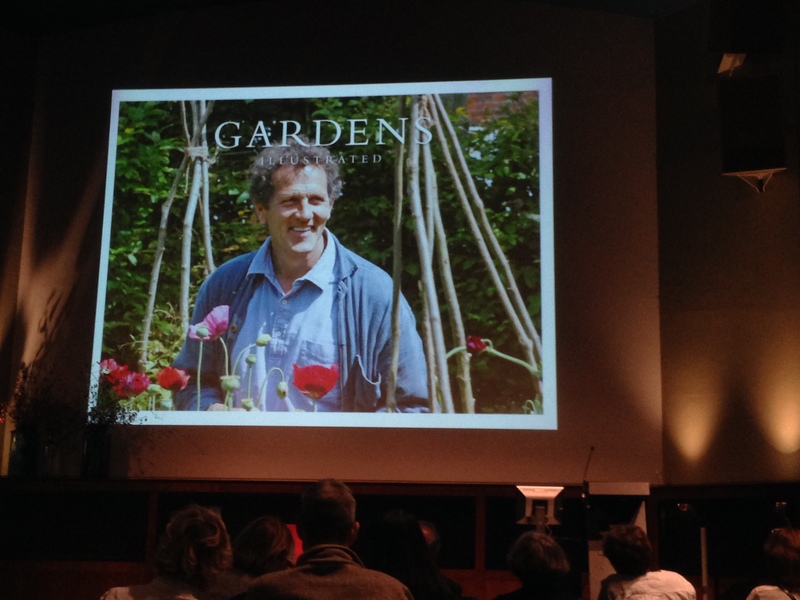 On Friday evening, Ade and I popped along to the Royal Geographical Society in Kensington to hear Monty Don speak at a Gardens Illustrated event. Now, for the benefit of our non-UK readers, let me explain that Monty Don is a British gardening writer and broadcaster. But he’s not just a gardener or presenter. Leaping amongst the Lysimachia with his tight black curls and boyish enthusiasm, there is something of the imp about Monty. He presents the BBC series Gardeners’ World from his own garden at his family home, Longmeadow. At least, this is what we’re lead to believe. You never actually see his house, which leads me to believe that he’s not really a person at all, but a pixie who lives in a toadstool at the bottom of his hornbeam hedge. I like Monty a lot. I first saw him speak at the Harvest at Jimmy’s festival back in 2011 and he comes across as a bit of a sage, wise well-beyond his extensive, self-taught horticultural knowledge. There is something of the philosopher or poet about him. Ade, however, LOVES him. Truly loves him. Major boy crush. When we saw Monty at Harvest at Jimmy’s, Ade made us race to the talk an hour early, just so we could get a seat right at the front. This meant we had to sit through the event that was on prior to Monty’s, which happened to be an edible hat workshop. That’s right. We learned how to fashion salad leaves into headwear, all for sake of getting a seat one foot away from Monty’s hallowed presence. The results were not pretty. 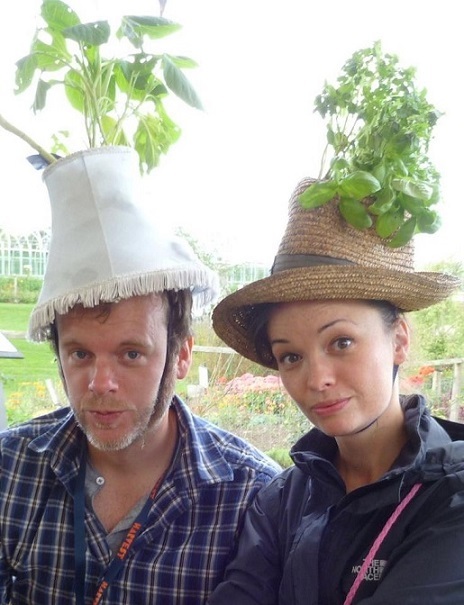 Monty did give an excellent talk that day; it was almost worth the indignity of being made to wear a basil bonnet for the preceding sixty minutes. (Almost). Once his talk was over and we got up to leave, we found ourselves standing a few inches away from Monty who had patiently waited behind to answer the gardening questions of audience members. “Go talk to him!” I said, nudging Ade in the ribs, much like a mother encouraging her timid son to ask the girl next door on a date. “I can’t!” He said, staring coyly at his shoes, cheeks all a-flushed. We never did get to talk to Monty that day, a fact which has quietly haunted Ade for the last three years. 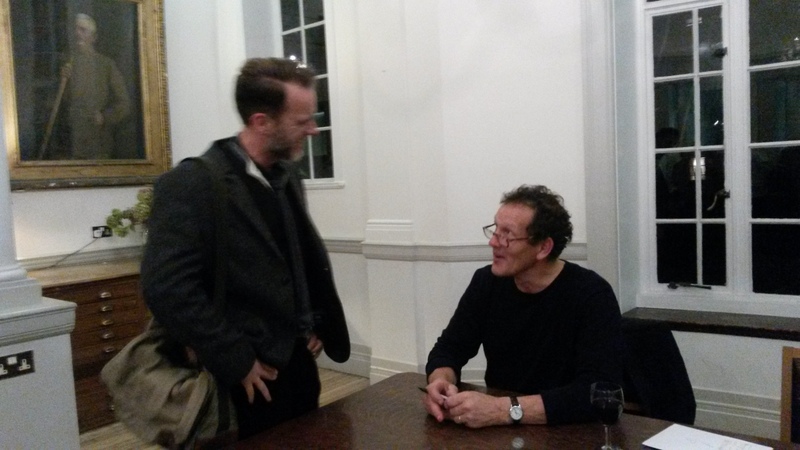 So when he heard that Monty was going to be talking at the Royal Geographical Society, he’d bought tickets before I’d even had a chance to check my diary. With a generous sprinkling of humour and enough references to Nigel to gratify those audience members who had sacrificed their Friday night fix of Gardener’s World to be there, (Nigel is Monty’s beloved golden retriever who makes regular appearances on Gardener’s World, allegedly receives his own fan mail and even has his own Twitter account), the event was an informative and entertaining look at Monty’s relationship with gardens. We went through this a good half a dozen times in the twenty minutes we spent queuing to meet The Great Monty. 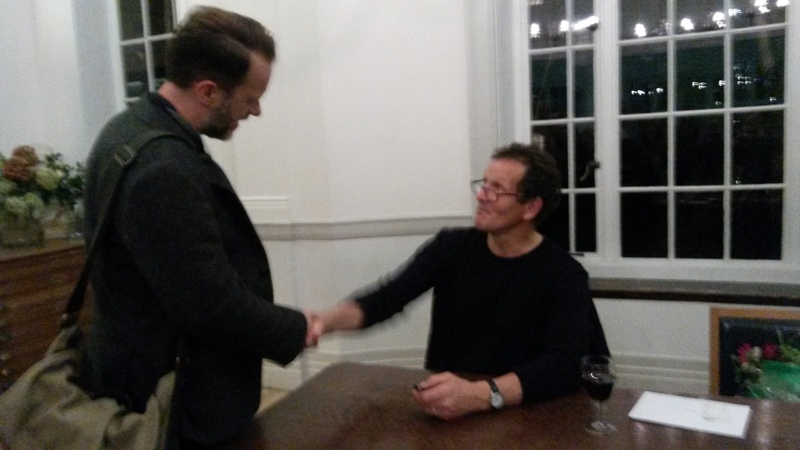 I eventually managed to persuade Ade to stay although I didn’t quite know how he was going get around the issue of not having a book – it was a book-signing after all. I was more than a little anxious that he might approach the desk, rip open his shirt and ask Monty to autograph his chest. The disciple met his teacher. Neo met The Architect. Aristotle met Plato. And I came away from the event with a free tote bag, the October edition of the magazine, and some complimentary seeds from the lovely folk at Gardens Illustrated. So it was smiles all round. Previous Eat No Onions or Garlic..
Of course I think the Real Monty looks very nervous about meeting Ade for the first time. He’s heard about Ade and it is obvious in that second photo that he is getting absolutely nowhere trying to encourage Ade to take up knitting and to leave horticulture to the Big Boys. Note the bribes caught on camera: Red wine, ball point pen, Rolex watch. Oh my goodness, Jenny, you’re absolutely right! How could we have not noticed?! Great story. It’s always nice to meet the very people that inspire you as Monty has me too. He’s a top man.